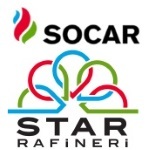 édité le 19/10/2018 - Plus de news de "Socar" - Voir la fiche entreprise de "Socar"
SOCAR, the largest direct foreign investor in Turkey, launched its $6.3-billion SOCAR Turkey Aegean Refinery - STAR Refinery, which will provide a large portion of oil products demand in the local market with 10 million tons of annual oil processing capacity. In coming years, SOCAR's new refinery will be a solid contribution to the economies of Azerbaijan and Turkey. SOCAR’s $6.3-billion STAR Refinery, one of the largest investment projects in Turkey, was inaugurated on October 19, 2018 in a ceremony held in Aliaga, Izmir. Alongside the refinery SOCAR has also launched its other projects - Petlim Container Terminal, Petkim Wind Power Plant and its regional head office. President Ilham Aliyev of the Republic of Azerbaijan, President Recep Tayyip Erdoğan of the Republic of Turkey, government officials of the two countries and numerous guests have attended the inauguration ceremony. Addressing the event, SOCAR President Rovnag Abdullayev spoke about the STAR project: ''Today is a historic day for us. Because we are launching the STAR Refinery, foundation of which was laid by the leaders of the two countries on October 25, 2011. The STAR Refinery, built and equipped with the world's latest technologies, helps integration of our petrochemical business and therefore has a strategic importance for our company. The refinery, with annual processing capacity of 10 million tons of crude oil, will make a significant contribution to the economy of Azerbaijan and Turkey''. STAR Refinery will strengthen Petkim's and SOCAR’s market power in the Mediterranean region. It will produce naphtha, the main crude material for Petkim, and considerably reduce Turkey's dependence on imports. STAR Refinery will process various types of oil, which is an indication of the refinery’s competitive edge. R. Abdullayev said SOCAR would continue investments in Turkey after the inauguration of the Refinery. He expressed gratitude to Turkish and Azerbaijani leaders, as well as other state and government officials, to TSGI alliance, the major contractor of the project, international financial institutions involved in financing the project, and everyone who contributed to the construction process of the refinery. STAR Refinery will meet a quarter of Turkey's oil products demand. STAR Refinery will help to reduce the current trade deficit in Turkish petrochemical sector, one of the largest oil consumers in Europe, the Middle East and Africa. It will produce oil products such as naphtha, xylene, diesel, aircraft fuel and LPG. The refinery, which has Turkey's first Strategic Investment Promotion Certificate, employed 19,500 workers from 14 countries, including 3,000 engineers at the peak stage of the construction. 1100 professionals will permanently work at the refinery after its launching. Shareholders of the project are SOCAR (60%) and the Ministry of Economy of Azerbaijan (40%). The Petlim Container Terminal, with a capacity of 1.5 million TEU, is one of the 3 largest ports in Turkey. Around $400 million has been invested in the terminal. SOCAR's renewable energy project PETKIM Wind Power Plant has a capacity of 51 MWT. The investment in this project totaled 55 million euros. The energy plant connected to Turkey's energy network will significantly contribute to meeting the energy needs of SOCAR in Aliaga.